Greg Biffle has been around racing for many years. After starting with a very successful company that built and maintained stock car style vehicles for the Northwest's touring series, In 1995, Benny Parsons took notice of Greg and approached Jack Roush about his talents. 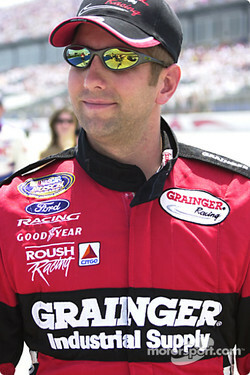 It would take until 1998, though, for Greg to receive "the call" when Roush Racing needed a driver for the Grainger Ford Craftsman Truck Series Team. He was Rookie of the Year that yearm and in 2000 took the NCTS championship. 2001 brought full time Busch Series racing to add to Greg's already impressive resume, and in 2002 he was crowned champion of that series. Biffle now enterers the elite field of Winston Cup drivers, driving a fifth entry for Roush Racing. With a strong stable of teammates to gather information from, Biffle enters the season as one of the favorites for the Raybestos rookie of the year honors. Biffle's teammates include Mark Martin, the 2nd place points finisher last season, Matt Kenseth, who garnered the most wins last season (5), Kurt Busch, who won 3 out of the last 5 races of the year, and seasoned professional Jeff Burton. "I am excited to get back going again," said Biffle. "I miss all the fans at all the tracks and doing the autograph signings at the souvenir trailers. I really enjoy that kind of thing. I just miss racing, I am ready to get back going." "I am more excited to get past Daytona and get to Rockingham and Vegas," the rookie continued. "Daytona is always so much pressure, it's our super bowl and we spend so much time and effort to get ready for this race. It is almost like you have both hands tied behind your back, you're so limited on the things you can do and try and get away with. A lot of effort and emphasis is placed on this race, and you are half drained when the season gets started just from all the efforts and pressures involved in Daytona." Biffle, who is the first driver to ever win the Busch and Truck titles, would like to add the Cup title to his list of merits, and car owner Jack Roush seems confident that he is the man to get the job done. "Greg Biffle is a young man in a hurry," said Roush. "I hope that team can get its legs under them and win the rookie title this year, win a race and get a pole. Then they can get organized to do some serious, big-time business in 2004." Biffle's most formidable competition for the rookie honors may be Ganassi driver Jamie McMurray, who first gained notoriety when he stepped in for the injured Sterling Marlin and won the fall Charlotte event in just his second start. That victory propelled him to the forefront of the ROTY race for 2003, and looks to be Biffle's greatest challenger. McMurray does, however, have some things to work through - a new team to contend with as the No. 42 Dodge voyages into new territories and works on duplicating the kind of chemistry McMurray's experienced on the No. 40 Dodge of Marlin. "This is what I have dreamed about as a kid, and it's an incredible feeling to know that I'm about to get ready to qualify and race in the Daytona 500," McMurray said. "There is so much history to the 500. This is our Super Bowl and I can't wait to compete in it." "This is virtually a new team that we have put together," McMurray added. "Donnie Wingo has assembled a great group of guys that have come from some of the best Winston Cup teams in the garage. While we have done some testing during the off season, the Daytona 500 will be our first race together." Among the class of 2003 are also Casey Mears, who is McMurray's teammate and brings with him an open wheel background. Mears was runner-up for the 1998 Indy Lights Championship and made several IRL and CART starts before coming to Busch in 2001. Three-time truck series champion Jack Sprague, former Grand National rookie of the year, Tony Raines, and son of motorsport legend A.J. Foyt, Larry, are also throwing their hats into the ROTY ring. Biffle's record still offers the most unswerving performances on the track, and this year's rookie race is definitely his to loose, and he knows it. "I just want to be competitive in the Winston Cup series," said Biffle. "I know that is going to be really tough. It takes a lot of guys seasons to be competitive, but I just hope that when we enter the Winston Cup series that we are prepared enough, have the right team, the right people in the right places and have the right equipment. Chassis. Engines. I mean the whole thing just has to be perfect to get a 15th place run. So, I am just hoping for all of those things, don't get me wrong I'm excited to be there, I'm excited to run in the top five; I'm not excited to go and run 27th every week or wherever. I'm nervous whether or not we're going to be able to be competitive every week or not."